The Leeds Stagecoach Route started out as an old Native American trail through the Little Cahaba River watershed. The earliest (before 1812) recorded travelers on the route were Christian Cherokees who worked with European circuit riders to establish Methodist churches in the Native American settlements along the way. Andrew Jackson had his scouts widen the route in 1812-1813 until they could easily move military supply wagons through the area. After white settlers began to flow into the area in 1820, the trail became a stagecoach route that was still in use when the first free black settlers started arriving in the 1880's. 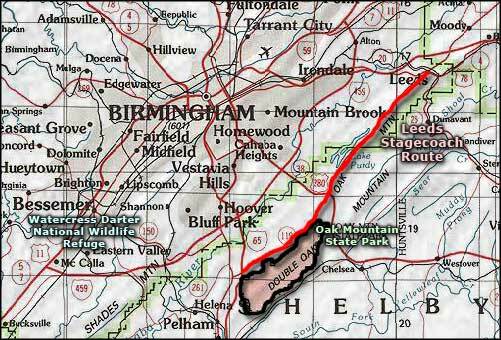 Today, the route is a paved road (Alabama Road 119/US Highway 411, the Cahaba Valley Road) that sees a lot of local use. It seems Leeds' biggest claim to fame comes from the story of John Henry and his famous duel with the steam drill. Many local folks are adamant that John Henry was a real person and the details of the legendary contest are based on fact. They even say the contest was held in the Oak Tunnel of the C&W Railroad just outside Leeds. The Leeds Stagecoach Route traverses a very historic area where little has changed from the late 1800's. This is an area where you can visit and enjoy a taste of Alabama's rich Appalachian heritage.